My Drug Genome is your resource to learn about how genetics can affect the way medications work and how genetic results can be incorporated into personalized patient care. 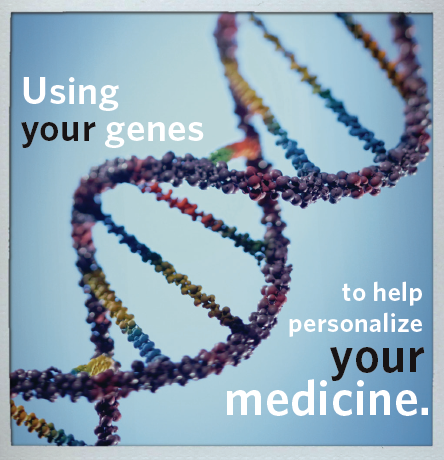 Part of personalized medicine means ensuring that patients receive medications that are right for them. What is PREDICT? Vanderbilt University has launched PREDICT (Pharmacogenomic Resource for Enhanced Decisions in Care & Treatment), which empowers patients and doctors with the genetic information needed to predict and help prevent bad drug side effects. Because each person responds differently to medicines, this knowledge helps doctors to prescribe drugs that work better and have fewer side effects. Why now? Genetic variation is an increasingly well-recognized contributor to variability in drug response and adverse drug reactions. The Food and Drug Administration (FDA) recognizes many of these associations. Currently at least 70 drugs have pharmacogenomic information in their FDA labels that affects prescribing. What is the goal of PREDICT? The long-term goal of PREDICT is to incorporate genetic data with clinically useful guidance into the VUMC Electronic Medical Record. What is tested through PREDICT? Using one blood test, patients are genotyped for 32 common polymorphisms within 8 genes associated with drug absorption, distribution, metabolism, and excretion. Thus, there is no need for multiple genetic tests – one genetic test has repeated utility. Only results for genes that have been reviewed and approved as actionable by Vanderbilt will be released into the patient chart. Does this program include cancer testing? No, the PREDICT program tests germline genetics (the genes you are born with) and not cancer mutations. Cancer testing is now being performed at Vanderbilt-Ingram Cancer Center (VICC). VICC is one of the first cancer centers in the nation to offer cancer patients routine genotyping of their tumors at the DNA level. MyCancerGenome.org is an online personalized cancer medicine resource and decision-making tool for physicians, patients, caregivers and researchers that gives up-to-date information on what mutations make cancers grow and matches tumor mutations to therapies. Questions? call the PREDICT hotline at (615)875-GENE (xt. 5-4363) or email predict@vanderbilt.edu. 2019, all rights reserved.